As a licensed chiropractor since 1987, Dr. Peter Meyer has been helping Jefferson Park and Norwood Park patients experience relief and discover optimal health and wellness through safe and effective chiropractic care. Since he started practicing in 1988, he has cared for countless patients across the spectrum. As our practice name indicates, we aim to provide that helping hand that allows the body to heal itself. As a family wellness practice, Helping Hands Chiropractic Care sees patients of all ages, from young children to active seniors. Whether we’re helping a child with an ear infection, an athlete who sustained an injury or a grandparent who wants to experience greater function, we’re here to help people live better, healthier lives. “I’m always motivated to help my patients get better so they can return to their favorite activities,” says Dr. Pete. In addition to offering exceptional chiropractic care to our patients, we provide something else that’s often lacking today—great customer service. 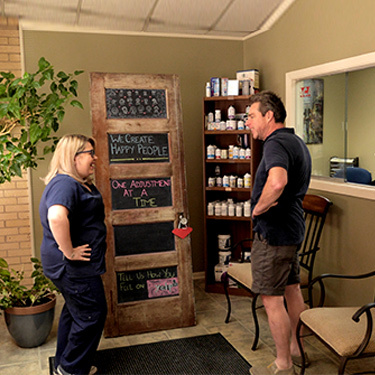 “I work hard at training my staff so that we provide the best customer service that we can,” says Dr. Pete. You can be confident that we aim to do our best for every person who walks through our door. Through chiropractic care, we’re removing the barriers that keep the body from healing itself. Through the chiropractic adjustment, the body’s healing powers are released as are its pain-fighting chemicals. Since Dr. Pete started practicing, he’s seen many, many miracle stories. One that comes to mind is a man who couldn’t work for the previous six months and could barely walk into the office. After a few months of care, he returned to work and hasn’t missed work since because he continues to get chiropractic care. When chiropractic becomes a healthy lifestyle habit, it can make such a positive difference! If you’re ready to experience the difference that chiropractic care can make in your life, contact our chiropractic office today to book a same-day appointment!